The earlier a musculoskeletal injury is treated, the sooner healing can begin. An untreated injury can easily slide from “acute” to “subacute” and even into “chronic”. Conventional medicine is keen to find a label, to make a diagnosis. This guides the treatment of the condition. Typical causes of musculoskeletal pain are osteoarthritis, rheumatoid arthritis, and gout. Unfortunately, this approach does not address the underlying cause of the symptoms. Conventional treatments are directed to suppress symptoms with little consideration to the reasons why a person is sick. Instead of treating the individual patient with the disease, the disease is treated instead. This type of treatment DOES NOT take into consideration the unique makeup of each individual. An abundance of literature shows that chronic use of anti-inflammatory drugs will damage the lining of the intestines and cause increased permeability which is called “leaky gut syndrome”. Leaky gut is linked to inflammation which can cause further aggravating and potentially worsening of arthritis pain. 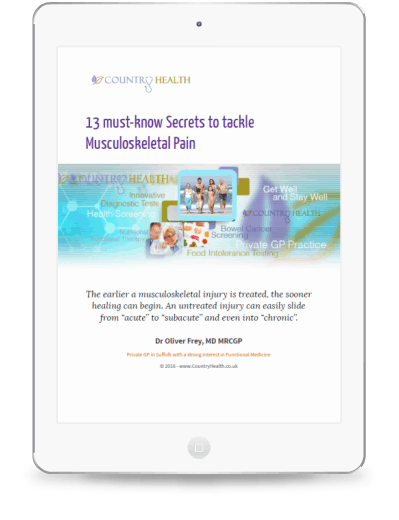 In this ebook, we will discuss the typical diagnoses for musculoskeletal pains from a functional medicine perspective, highlight the need for further analysis and suggest functional treatment approaches, that address the causes rather than covering up the symptoms. The potential costs associated with an accident involving an employee who turns out to be without a valid driving licence, particularly where a fatality has occurred, can be astronomical. 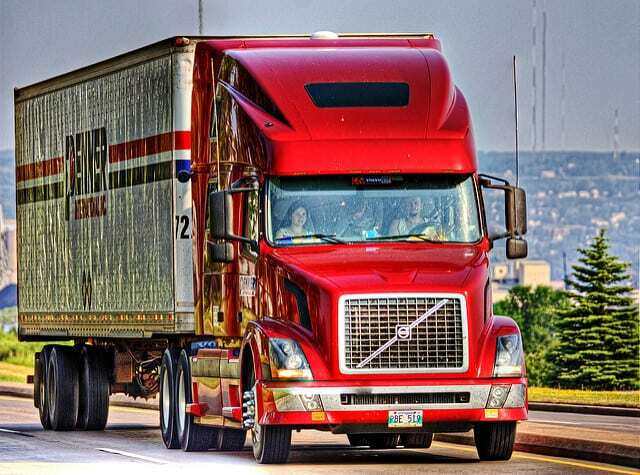 Failure to renew an HGV licence and to undergo a required medical means the licence expires automatically. Driving without a licence is a criminal offence. The insurance is invalidated, putting the employers Operator's Licence and reputation at risk. Many GPs have long waiting times to get an appointment for a DVLA medical and charge much more than CountryHealth. We are happy to help you and your staff to stay legally on the road with speedy access to DVLA medicals at a fair price. In our private GP practice we can also help to get your staff quickly back on the road should they fall ill.
Let us know when we can help you. Regular price £ 99. Save with our ComCare360 membership. WHAT IS THE AUTOIMMUNE PALEO DIET? The Autoimmune Paleo Diet is an elimination diet that has been specifically designed to help those suffering from autoimmunity determine their food allergies and sensitivities, reverse nutrient deficiencies, balance gut flora, and heal their bodies over the long-term. The protocol, otherwise known as “The Paleo Approach” has been developed and refined by Dr. Sarah Ballantyne, and is outlined in detail in her book The Paleo Approach. We believe this is the best and most specific elimination protocol for those with autoimmune disease, and following it gives you the best chance to come up with your personalized healing diet. In a nutshell, the Autoimmune Protocol calls for removing foods that are most likely to be problematic for people with autoimmune disease—grains, beans, legumes, dairy, eggs, nuts, seeds, nightshades, as well as food chemicals and additives. In addition, nutrient-dense foods are added to restore nutrient status, such as bone broth, high-quality meat and wild-caught fish, as well as organ meats, fermented foods and a wide variety of fruits and vegetables. Over the course of the elimination phase (which can last from a month to a year), you take note of the changes you experience in your health. When it comes time to slowly and systematically reintroduce foods, you will be able to tell exactly which foods are holding you back, and able to use this information to construct a diet that will best support your healing needs. WHY IS THE AUTOIMMUNE PROTOCOL AN IDEAL STARTING POINT? Autoimmune disease is all about an immune system that has gone awry. 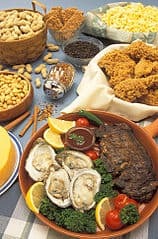 Micronutrient deficiencies are common in autoimmune disease. The Autoimmune Protocol provides us with a clean slate. It removes foods that may trigger an immune response, are harmful to the gut, and lead to hormone dysregulation. It restores nutrients and flora that promote a healthy gut and well-regulated immune function. It provides a framework for building a life-long diet exactly suited to you. CountryHealth takes no responsibility for any links shared in this blog. Please see our disclaimer. 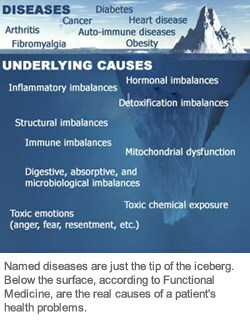 As the graphic of an iceberg shows, a named disease such as diabetes, cancer, or fibromyalgia might be visible above the surface, but according to Functional Medicine, the cause lies in the altered physiology below the surface. Almost always, the cause of the disease and its symptoms is an underlying dysfunction and/or an imbalance of bodily systems. If health care treats just the tip of the iceberg, it rarely leads to long-term relief and vibrancy. Identifying and treating the underlying root cause or causes, as Functional Medicine does, has a much better chance to successfully resolve a patient's health challenge. Using scientific principles, advanced diagnostic testing and treatments other than drugs or surgery, Functional Medicine restores balance in the body's primary physiological processes. The goal: the patient's lifelong optimal health. Add what's lacking in the body to nudge its physiology back to a state of optimal functioning. Plainly put, your body naturally wants to be healthy. But things needed by the body to function at its best might be missing, or something might be standing in the way of its best functioning. Functional Medicine first identifies the factors responsible for the malfunctioning. Then it deals with those factors in a way appropriate to the patient's particular situation. Very often Functional Medicine practitioners use advanced laboratory testing to identify the root cause or causes of the patient's health problem. Old-fashioned medical diagnosis helps too, in the form of listening carefully to the patient's history of symptoms and asking questions about his or her activities and lifestyle. For treatment, Functional Medicine practitioners use a combination of natural agents (supplements, herbs, nutraceuticals and homeopathics), nutritional and lifestyle changes, spiritual/emotional counseling, and pharmaceuticals, if necessary to prod a patient's physiology back to an optimal state. In addition, educating the patient about their condition empowers them to take charge of their own health, ultimately leading to greater success in treatment. In the dominant health care model today, medication is used to get rid of people's symptoms. If the patient stops taking the medication, symptoms generally return. Functional Medicine approaches health problems differently. Instead of masking the problem, it aims at restoring the body's natural functioning. Although Functional Medicine practitioners may prescribe pharmaceuticals, they are used to gently nudge the patient's physiology in a positive direction so the patient will no longer need them. For example, conventional doctors would normally prescribe pharmaceuticals like Prilosec, Prevacid or Aciphex to treat acid reflux or heartburn. When the patient stops taking such drugs, the heartburn symptoms come back. In contrast, a Functional Medicine practitioner might find that a patient's acid reflux is caused by Helicobacter pylori bacteria. Eradicating the Helicobacter pylori might very well lead to the end of heartburn symptoms, permanently. It's also important to note that in Functional Medicine, treatment for similar symptoms might vary tremendously for different patients, according to their medical history and results of laboratory tests. Factors that can come into play in producing the same symptoms include toxic chemicals, pathogenic bacteria, parasites, chronic viral pathogens, emotional poisons like anger, greed or envy, and structural factors such as tumors or cysts. You may be surprised to learn that Functional Medicine isn't new. It actually represents a return to the roots of modern scientific medicine, captured in this statement by Sir William Osler, one of the first professors at Johns Hopkins University School of Medicine and later its Physician-in-Chief: "The good physician treats the disease; the great physician treats the patient who has the disease." Another important saying by Osler is "If you listen carefully to the patient, they will tell you the diagnosis." This encapsulates the importance placed in Functional Medicine on taking a thorough history from the patient.